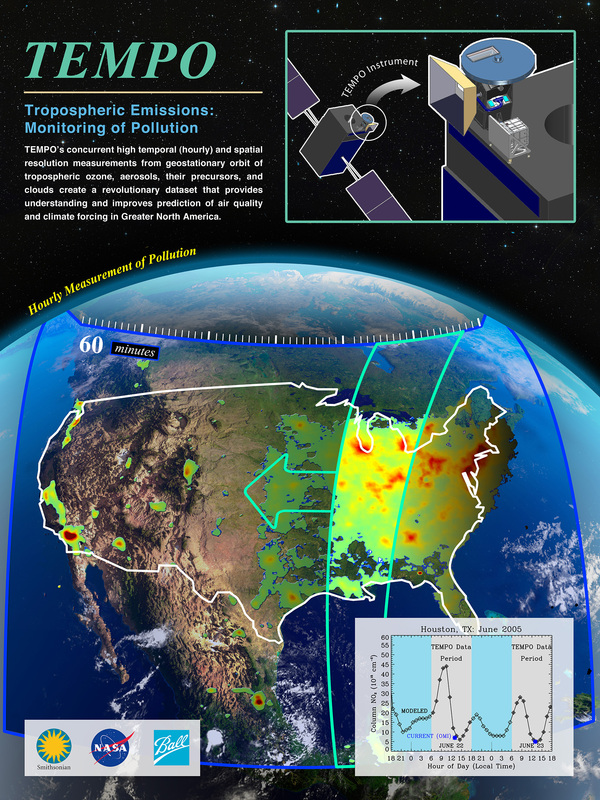 May 11, 2015 – A space-based instrument that will monitor major air pollutants across North America on an hourly basis passed a major milestone by successfully completing a critical NASA review. The instrument – Tropospheric Emissions: Monitoring of Pollution, or TEMPO – was confirmed by NASA’s Science Mission Directorate on April 10, 2015 to continue into the development phase of the project. In this phase, the TEMPO team will complete the design that meets the science and measurement requirements and begin fabrication of test and flight hardware and software that will result in delivery of the instrument. The next significant milestone for the TEMPO team is a critical design review in June 2015. The instrument will be completed in 2017 at a cost of no more than $93.2 million, excluding the launch vehicle and integration to the satellite platform. The TEMPO instrument will share a ride on a commercial satellite as a hosted payload. Launch is expected no later than 2021. The investigation will make observations from geostationary orbit many times per day of pollution concentrations in Earth’s lower atmosphere, called the troposphere. After being deployed, TEMPO will observe Earth’s atmosphere in ultraviolet and visible wavelengths to determine concentrations of many key atmospheric pollutants, such as ozone, nitrogen dioxide, and formaldehyde. The competitively selected TEMPO project is led by principal investigator Kelly Chance at the Smithsonian Astrophysical Observatory in Cambridge, Massachusetts. The project scientist, David Flittner, and project manager, Wendy Pennington, are based at NASA’s Langley Research Center in Hampton, Virginia. “The team is looking forward to continuing to the next phase of the project to build the TEMPO instrument that will serve as the North American geostationary component for air-quality monitoring,” said Pennington. The TEMPO team also includes Xiong Liu, deputy principal investigator; Ball Aerospace Technologies Corp, led by Dennis Nicks; NASA’s Goddard Space Flight Center in Greenbelt, Maryland; the U.S. Environmental Protection Agency in Research Triangle Park, North Carolina; and several U.S. universities and research organizations. TEMPO was chosen from 14 proposals submitted to NASA’s initial request for proposals in the Earth Venture Instrument solicitation. Earth Venture missions, part of the Earth System Science Pathfinder program, are small, targeted science investigations that complement NASA’s larger research missions. Langley manages the Earth System Science Pathfinder program for NASA’s Science Mission Directorate, Earth Science Division.